Image caption Mario Draghi said the eurozone was experiencing a "robust recovery"
The European Central Bank (ECB) has insisted there is still a long way to go before it can call a halt to its economic stimulus programme. ECB president Mario Draghi threw cold water on speculation that the bank might wind the programme down soon. The bank is still buying 60bn euros (£53bn) of bonds a month as part of its quantitative easing (QE) programme. The ECB also kept the key interest rate for the countries that use the euro currency unchanged at 0%. Mr Draghi said: "After a long time we are finally experiencing a robust recovery, where we only have to wait for wages and prices to follow a course towards our objective. "The last thing the governing council wants is an unwanted tightening and for conditions that may either slow down this process or even jeopardise it." Claus Vistesen, chief eurozone economist at Pantheon Macroeconomics, said: "The comment on inflation which is sticking in our head is Mr Draghi's notice to markets that: 'We are not there yet.'" However, the euro did move sharply to a 14-month high against the dollar when at one point Mr Draghi hinted that the governing council of the ECB might start discussing reducing QE in the autumn. Neil Wilson from ETX Capital commented: "It wasn't much but the market is super-sensitive to anything from Draghi at the moment." Last month, Mr Draghi's speech in Sintra in Portugal was interpreted by many economists as meaning the eurozone's economic recovery would allow QE to end and for interest rates to rise. 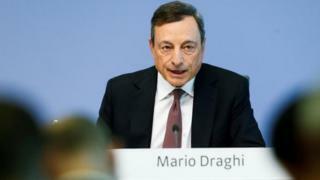 Patrick O'Donnell, senior investment manager at Aberdeen Asset Management, said: "This is a well-choreographed attempt by Mr Draghi to make sure that financial markets don't get ahead of themselves after his more hawkish comments of late." The QE bond-buying programme, together with ultra-low interest rates, was designed to encourage lending and fend off the threat of deflation in the eurozone. Mr Draghi said the policy had been a success: "We have created in the last three years six million jobs, much more than any time before the crisis in the same amount of time. "All the economic sentiment indicators and survey indicators are either at all time highs or close to them so the policies have been successful." However, the inflation rate in the eurozone was 1.3% in June, down slightly from 1.4% in May, some way below the ECB's target of close to, but below, 2%. Mr Draghi said: "Measures of underlying inflation remain low and have yet to show convincing signs of a pick-up, as domestic cost pressures, including wage growth, are still subdued. Underlying inflation in the euro area is expected to rise only gradually over the medium term." Aberdeen Asset Management's Mr O'Donnell said: "We probably won't hear anything significant out of the ECB until September, which is plenty of time for investors to digest Mr Draghi's caveat laden hawkishness. "Mr Draghi will be hoping that today's performance is enough to give him a quiet summer."